Highlights of the Oklahoma Transportation Commission’s Monday, Aug. 6 meeting include the debut of a new Oklahoma Department of Transportation program to assist motorists stranded in work zones, an executive session and action on Secretary of Transportation and ODOT Executive Director Mike Patterson’s salary and a sendoff for Chief Engineer Casey Shell and District Eight Commissioner Peter Regan. Contracts were awarded for projects including I-40 interchange reconstruction in Sequoyah County and SH-11 bridge rehabilitation in Tulsa County. 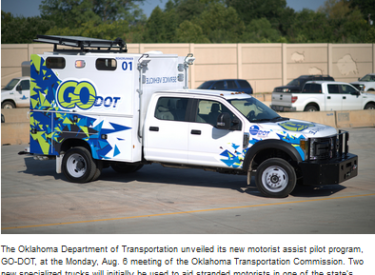 Patterson and Commissioner of Public Safety Rusty Rhoades unveiled GO-DOT, a set of two new specialized trucks designed to assist motorists who are stranded in highway work zones. The trucks will be initially deployed in the I-235 work zone between N. 36th St. and I-44 in Oklahoma City and will be later used in other heavily-traveled construction areas. During his report to the commission, Patterson recognized Casey Shell, ODOT’s longtime chief engineer, who is retiring after more than 30 years of service to the state. Shell’s accomplishments include overseeing emergency repair and now replacement of the US-77/SH-39 bridge between Purcell and Lexington, increasing ODOT’s asset preservation efforts and overseeing execution of the Eight-year Construction Work Plan. Commissioners also said goodbye to District Eight Commissioner Peter Regan, who is stepping down from the board due to his increased workload. Regan was recognized as being a true public servant and was given a brick from historic Route 66 as a token of appreciation for his nearly ten years of service. Members of the commission met in an executive session to discuss Patterson’s performance evaluation and salary. Following the executive session, they unanimously voted to increase Patterson’s salary from $156,000 to $185,000 annually. The commission voted to award a more than $42 million contract to reconstruct the I-40 interchange at US-64 near Sallisaw in Sequoyah County. The project will also replace the I-40 bridges over the Kansas City Southern railroad and two creeks near the interchange and will address a total of four structurally deficient bridges. Commissioners also awarded a contract for a nearly $9 million project in Tulsa to rehabilitate the SH-11 bridges over the BNSF railroad and Pine St. and the SH-11 ramp over I-244. Commissioners voted to award 17 contracts totaling more than $76 million to improve highways, roads and bridges in 14 counties. Contracts were awarded for projects in Cherokee, Cotton, Creek, Haskell, Kingfisher, McCurtain, Muskogee, Oklahoma, Pittsburg, Sequoyah, Tillman, Tulsa, Wagoner and Woods counties. A list of all awarded contracts may be found by visiting www.odot.org/contracts, selecting the July 2018 letting and clicking Go and then Award. The eight-member panel, appointed by the governor to oversee the state’s transportation development, awards project contracts for road and bridge construction every month. Due to the Labor Day holiday, the commission’s next meeting is scheduled for 11 a.m. Monday, Sept. 10. Contracts, bid information, the commission’s monthly agenda and project details can be viewed at www.odot.org.